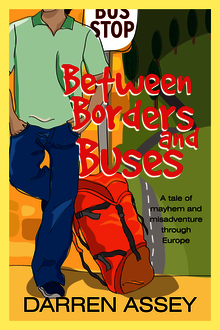 What happens when you take a clumsy Australian of Anglo Indian descent, a backpack, stick him on a bus in Europe and close the door? A good question, the answer to which Darren was eager to discover. After spending an eternity behind bars serving beer to red-faced Poms, Darren is allowed to escape and decides to make the most of it. Relying on nothing but his wits and a rough plan, he leaves the UK for an eye-opening, sometimes annoying, but always memorable experience around Europe. From space cakes in Amsterdam, motor scooter mishaps in the Greek Islands, a severe lack of direction in Sicily and a stubborn tent in Portugal, Darren realises he needs more than his wits to survive Europe—he needs a bloody miracle! Informative enough to make you go “Oh really? I didn’t know that” and entertaining enough to make you sit up and giggle, Between Borders and Buses is guaranteed to ignite your desire to pack your bags, hop on the next flight out of the country and discover Europe for yourself.